An awning is far more than just safe shelter from the sun or rain. A stylish wooden setup will protect your deck and patio from damage caused by the elements, potentially saving you a small fortune in maintenance and repair costs down the line. 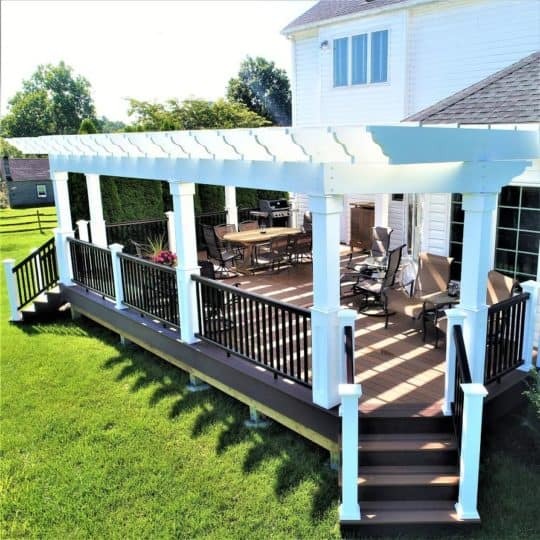 At Paul Construction and Awning, we specialize in installing high-quality wooden awnings for patios, tailoring each element of your shade solution to your preferences. For over 25 years, homeowners have relied on the certified installers at Paul Construction and Awning to erect long-lasting shade solutions that are just as stylish as they are durable. We also offer custom patios, beautiful sunrooms, composite decking, and much more. To get a quote or to learn more about our services, call us today at 610-287-1623. We design our wooden awnings to blend in the with the natural elements of the landscape. This creates a classic look that will never go out of style. Our awnings are available in a wide range of wood types, stains, and colors, making it easy for you to pick a shade solution that is in line with your design goals and complements your home’s architecture. We also install Sunesta‘s famous retractable awnings, which you can customize with a variety of features such as motorization, smart arm folding, dimable LED lights, and more. Whatever the project, we stand by the quality of our craftsmanship. That’s why we back our projects with a workmanship lifetime warranty. During your consultation, our crew will visit your home, evaluate your property, and provide you with actionable solutions to your wants and needs. You won’t have to wait longer than a week until after your consultation to see hand-drawn sketches of our plans for your outdoor space. We have one simple motto; our job isn’t done until you are 100% satisfied with the results. Spend more time outdoors with the right kind of coverage from Paul Construction and Awning. You will struggle to find a more committed, experienced crew than our master craftsmen and certified installers. Call us at 610-287-1623 to get started.